Sen. Elizabeth Warren, a Democratic presidential hopeful from Massachusetts, speaks with NHPR's Peter Biello about her policy goals. Democratic presidential hopeful Elizabeth Warren speaks during a women's economic forum April 12, 2019 at Portsmouth High School. Elizabeth Warren discusses her campaign policy ideas with NHPR's Peter Biello. As presidential candidates make their way through New Hampshire to meet with voters, NHPR is sitting down with them to chat about the issues affecting Granite Staters. NHPR's Peter Biello spoke with Massachusetts Sen. Elizabeth Warren in Portsmouth during one of her weekend visits. He asked Warren about tax policy and her support of abolishing the Electoral College. Listen to the broadcast version of the interview between NHPR's Peter Biello and Massachusetts Sen. Elizabeth Warren. So I want to ask you about a couple of words. One is a word you use pretty often and that's fight. We know that you're a fighter. I wanted to ask about a different word, compromise, and about a specific time that you can recall where you have used the skills that you have to compromise with those who disagree with you to get something important done. Sure. You know, that's why I'm in Washington is to try to make a difference in the lives of real people. And if compromise is the way to get there, if keeping it under the radar screen is the way to get there, count me in. But I do want to say, if the question is how to take away health care from 20 million Americans, I don't see the compromise as gee would you agree to only take it away from 10 million? There have to be points where you draw a line and say no. I'm in this fight because I believe health care is a basic human right, and we fight for basic human rights. So compromise sometimes. Fight sometimes. And I hope I can figure out the difference. You just mentioned health care, but what about taxes for example, where that too like health care might be a fight with Republicans? How would you deploy any kind of negotiation skills to sort of get some movement on some of the tax proposals that you've made so far? That's a really good question, but let me start with just the basics for example of my wealth tax proposal. And that says the biggest fortunes in this country, the ones that are $50 million or above, on their $50 millionth and first dollar they ought to have to pay two cents and so on for the rest of the dollars above $50 million. Now there are a lot of Republicans who just say no in Washington. Nope, not doing it because you're talking about increasing taxes. But here's the deal, people across this country, whether they're Democrats, Republicans or Independents, think that's a pretty darn good idea. And [they] recognize that those at the top, they’ve got to pay something too to make this country work. You know, 2 percent on the biggest fortunes in this country, we could pay for universal child care [for] every kid in this country – universal pre-K, universal pre-pre-K – and still have two trillion dollars left over. And I think the real way to push this one is to try to get Washington to align with what most people in this country would like to see. Can I ask you what your plans might be for that extra two trillion dollars you just mentioned? Sure. So this is the fun part is to talk about the kinds of investments we could make. We could reduce the student loan debt burden. We could actually build out on housing, and reduce rents across this country and make home-ownership more possible for more people. We could do a down payment on a Green New Deal. We could rebuild our infrastructure in this country. It's all about just trying to get some balance. I don't think most people in this country are trying to get over on someone else, trying to get a special leg up. I think they just want a system that's fair, and a 2 percent wealth tax just helps level the playing field. It just lets us make some of the investments. I want to make sure I get your thoughts on a few things, things that other Democrats in the race are talking about. One of them is whether or not we should abolish the Electoral College. What do you think about that? Yes, we should. I believe every vote should count. You know what happens right now is that no presidential candidate in a general election goes to Mississippi, goes to Alabama, or goes to Massachusetts or goes to California because we're not considered states that are in play. Well I think when you run for president, you ought to run for president of all the people. And that means you ought to be asking everyone for their votes, not just people in a handful of so-called battleground states. NHPR's Peter Biello interviews Elizabeth Warren in Portsmouth. So we could do it by abolishing the Electoral College, but you know we don't even have to go all the way to doing a constitutional amendment. Right now, we have the idea of a national popular vote and a compact among the states in which states sign on and say, hey we agree that when enough states have agreed, we will cast our electoral votes for whoever got the majority of votes in the country -- the majority of real votes. That would be sufficient instead of abolishing the Electoral College? Yep. And by the way, we're on the way. I think just last week New Mexico became the latest state to say we're all in on this. We're about two thirds of the way there. What about adding justices to the Supreme Court? Are you in favor of that? This is one that I think we need to have more of a conversation around. I realize we can do it without a constitutional amendment, but I'm hesitant and I want to think through what our options are. Look, part of what really worries me is how much the federal courts have become politicized. The whole concept in the Constitution was that we would have an independent judiciary, and that means not just a Supreme Court that's not political, but Court of Appeals [and] District Courts. The reason we gave them lifetime tenure was to insulate them from politics. And now instead they become one more pawn in the political game. We're going to have to have a big conversation about our courts overall, particularly about a Supreme Court that has become increasingly pro-corporate and very, very politicized. You're known for having very detailed policy positions. And we're wondering what might be the next big policy proposal that you're going to get ready to roll out? College and student loans. Stay tuned. Oh come on. You can kind of figure out where I'm going on this stuff. Also another one to talk about [is] some environmental issues. So more to come. 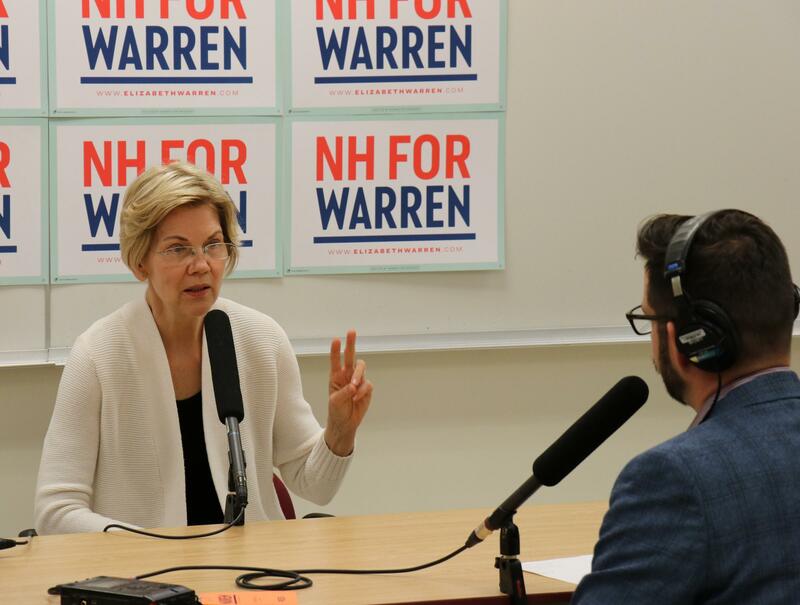 Listen to the unedited version of the interview between NHPR's Peter Biello and Massachusetts Sen. Elizabeth Warren. For the growing field of Democrats running for president, the early stage of the campaign includes an important choice: whether to try and inspire with grand ideas, or focus on the details of policy from the get-go. Candidates who've been in New Hampshire recently are landing on very different sides of that question -- but some voters would rather have it both ways. NHPR's Morning Edition Host Rick Ganley is sitting down with presidential candidates as they make their early trips through the Granite State to meet with potential voters. Rick recently caught up with New York Sen. Kirsten Gillibrand at a restaurant in Concord. New Jersey Sen. Cory Booker has made two campaign sweeps of New Hampshire since he announced his presidential bid Feb. 1. The former mayor of Newark, who was first elected to the U.S. Senate in a special election in 2013, sat down for a recent interview with Morning Edition Host Rick Ganley at the Airport Diner in Manchester. Presidential candidates have already been spending a lot of time in New Hampshire. Morning Edition Host Rick Ganley has been sitting down with them to chat about where they stand on the issues facing Granite Staters. Richard Lobban was among the roughly 50 people who packed inside the Rockingham County Democrats Regional Office in Londonderry to hear Massachusetts Sen. Elizabeth Warren make her presidential campaign pitch Saturday night. Lobban said he was — like a lot of his fellow New Hampshire Democrats — still very much untethered to any of the 18 declared candidates in the race for the 2020 presidential nomination.